Explanation of the chart Cycle of Life prepared by Lua Getsinger. Posted by, and name retained with, permission of recipient. First is a text version of the letter, followed by a scan of it. In an email message of 31 October 1997, Mr. Theodore A. Cope, who is preparing for an article on “Neoplatonism and Bahá'í philosophy”, asks about the authenticity of a diagram depicting “an Arc of Descent and Ascent” [online at bahai-library.com/abdulbaha_chart_spiritual_evolution]. Mr. Cope supplies the text accompanying the diagram which asserts that the diagram was given to Mrs. Lua Getsinger by `Abdu'l-Bahá, and that it illustrates “the true story of evolution”. We reply as follows. 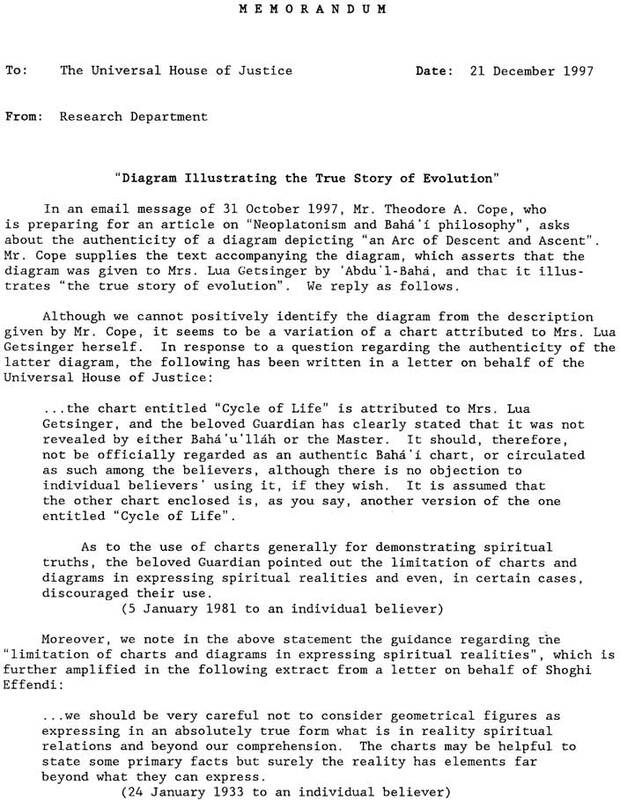 …the chart entitled “Cycle of Life” is attributed to Mrs. Lua Getsinger, and the beloved Guardian has clearly stated that it was not revealed by either Bahá'u'lláh or the Master. It should, therefore, not be officially regarded as an authentic Bahá'í chart, or circulated as such among the believers, although there is no objection to individual believers’ using it, of they wish. It is assumed that the other chart enclosed is, as you say, another version of the one entitled “Cycle of Life”. As to the use of charts generally for demonstrating spiritual truths, the beloved Guardian pointed out the limitation of charts and diagrams in expressing spiritual realities and even, in certain cases, discouraged their use. …we should be very careful not to consider geometrical figures as expressing in an absolutely true form what is in reality spiritual relations and beyond our comprehension. The charts may be helpful to state some primary facts but surely the reality has elements far beyond what they can express.